Star Spangled Banner under a Star-Strewn Sky "Petra's Great Temple"
With a fresh alert from the U.S. Embassy cautioning Americans in Jordan to keep a low profile amid threats from the Bin Laden contingent, even the most intrepid patriots among us favored the selection of a secluded spot for our Independence Day festivities. The Embassy had called off its own holiday bash, but we were not to be deterred. The dig season wasn't halfway over, but the heat and grueling schedule were taking their toll. Languid debate percolated over whether the last few days, unseasonably humid, had reached 112 degrees, or merely 107.5. To observe the 5:30 a.m. daily meeting time that had initially demanded a 4:30 wakeup, I was now contemplating sleeping in my boots for the quickest possible launch from bed to the waiting truck. We needed a party, and it would take more than a terrorist to hold us back. The Brown team's annual Fourth of July bash--ushered in with a softball game and out with music and singing--was famous in these parts before ARCHAEOLOGY magazine ever ran its story (see "Fourth in the Field," July/August 2000). Beidha, an 8,000-year-old site in the middle of the desert where archaeologists found the specialized workshops of ancient butchers, lithics experts, figurine makers, and potters, will be the setting of the celebration. Much remains unearthed at this Neolithic site, destroyed by earthquake millennia ago, where unexcavated hunks of dirt are pummeled and melted by weather. Amid the modest ruins, a family of Bedouins collect an array of potsherds for sale outside their tent, but few come to admire this site so very much less grand than Petra, though just ten harrowing minutes away by flatbed truck. Near what is now prime goat-herding territory we find our baseball field--minimally rocky (a relative proposition around here) and flat, bounded by steep rock all around. Here was a fifth-century caravansary, where parades of camels and traders bearing a ransom in international goods once took respite. 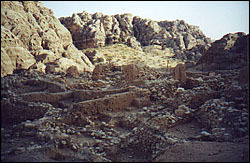 The spot is marked by an unmistakable rectangle of stones, never excavated. From the Nabataean period, there was probably a cistern here to collect the water that fell into the valley. Once we parked the trucks and strung our flags across them, received our "mabruk"s (congratulations) and "you are welcome"s from our Bedouin guests, pulled out our solitary bat and ball, and assigned team captains, there was little talk of archeology--or of America. This was all about the game. It's the Agrabs vs. the Dobs--the scorpions vs. the bears. Quite a nail-biting draft process started things off that threatened to be all too reminiscent of childhood gym classes, but I was tapped eventually and the game began. The outfield was 20 strong, but with work-gloves instead of mitts, the fumble factor was high. The nobody-strikes-out rule worked in my favor, and, sprinting madly, I managed to make it almost to first base before being tagged out. 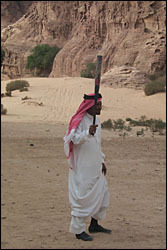 "I think you must walk faster after you hit the ball," a Bedouin who had never before seen a baseball told me helpfully when I had huffed back to the line of trucks--Toyotas, mostly--that was our dugout. After that and a few occasions on which the ball came right towards me in the outfield (and might even have hit me in the hands had I not wisely ducked and shrieked), I decided I could better serve my country by retiring to a rocky perch with a few of the local women to chat and take notes. 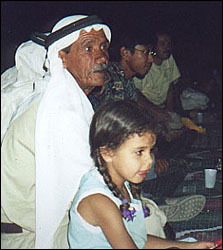 The older benat--girls--did not play, but Bedriyeh, only 12, did. Elizabeth tries for first base. 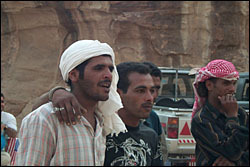 The Bedouins played shoeless on the rocky terrain, sandy and lumpy like a camel's back, full of pocks and crevices sprouting occasional tufts of wiry green growth. 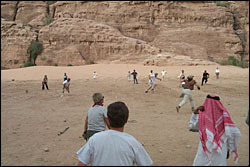 The Bedouins didn't know baseball, but they threw long, arching balls, hit drives that went on forever, ran fast, and made miraculous catches, jumping, diving, and scampering up the rock. Hamoudeh played in a crisp, long, white shirtdress called a thop and red-and-white keffiyeh--particularly apt on this patriotic occasion--on his head. National Geographic, he said smiling a wild, half-toothless smile and pointing proudly to his attire. He ran like a crab--sideways and comical--smiling as always and holding his keffiyeh on his head with one hand. Gossam, in salmon-colored jeans and a plaid shirt, looked even more rakish than usual with his white keffiyeh wrapped on itself and draped to one side, his feminine, kohl-rimmed eyes sparkling like black rubies under his heavy eyebrows. He strode elegantly and arrogantly to bat. "Just do it," his friend called. They may not have known baseball, but they knew Nike. Gossam hit the ball crazy-long and watched it go. To mad cries of "run, run," he finally did. He shot up the middle, past the pitcher, and kept going. But the next batter made it to first base, and the guy after him would have made it as well, if the first batter hadn't stayed on base to catch the ball intended for the baseman and tagged out his own runner. John, the illustrator, went to bat for the other team, and Gossam sprinted up the rock in the outfield, anticipating a hard hit. The ball fell just short, and Gossam jumped 15 feet down to catch it, floating a perfect, long throw to the pitcher as he tumbled down. I'd like to see the Yankees do that. Still, this was more like holiday croquet than guts-ball. A wild-haired, scruffy Bedouin with dancing eyes and a moustache who looked like a model from glossy, ratty-chic ads in Bazaar or Vogue stubbed out a cigarette as he bent to pick up the bat. Then, suddenly, it was over. There was clapping, laughing, a hand-slapping line-up of the most motley variety, minimal hooting, and no rioting at all--blame it on the lack of beer vendors. Unable to quite decipher the scoreboard, a pile of rocks on either side of a line in the sand, I asked Martha Joukowsky, director of the Great Temple excavations and general manager of the Dobs, who won. "The Agrabs won," she said. "I don't know how much they won by, but it was a goodly amount." Sure enough, one pile of rocks towered embarrassingly over the other. We caravaned to the dinner spot ten to a truck, the local drivers drag racing through the desert over impossible sandy, scrubby mounds, the Americans creeping behind and still feeling every bump. The spot was perfect, surrounded by high, rocky outcroppings carved with niches. Someone had arranged the letters "USA" in white stones to greet us. In spite of the baseball game, everyone looked fresh; I had become accustomed to seeing the group on site through a cloud of dust. Martha wore a festive holiday crown, and the little Bedouin girls shouted, "Martha, you are a queen!" Her grown daughter Nina, however, had left behind her own milinary concoction, a charming Victorian-looking bonnet made of a straw hat with a white keffiyeh tied over the top and around her chin. Her brother Misha sported a dapper Panama hat. Martha's granddaughters were a vision in red, white, and blue. Dachlala and his grandaughter Donya enjoy the holiday feast seated on low cushions. Dinner was perfect--barbecued chicken, sweet and moist; goat; grilled, whole tomatoes and onions; pita; labeneh; hummus; babaganous; salads in vinaigrette--and we ate on cushions around a tablecloth, as is the local tradition. 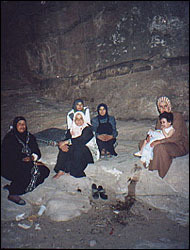 The women with covered heads gathered and ate alone, together on a separate jutting of rock. It grew dark and cooler, and we strung up American flags and lit a candle in each rocky niche. The place flickered and glowed a warm orange. The candles and the hum of conversation around shared food blurred the edges of the senses like a second glass of wine. I thought of the lamps we'd found at the Great Temple and the way the flames in the scattered niches illuminated everything that night as they must have long ago. 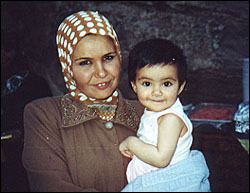 Acil and her mom help celebrate the Fourth. Gossam brought out his flute. The music whistled and chirped up the scale--airy, shrill, and lilting. I listened with closed eyes. Jared played jazzy riffs on his guitar--moody notes that fluttered down the rocks, his shadow blown up on the mountain behind him. We sang the "Star Spangled Banner" and a John Denver number and clapped along to the Bedouin songs, deep and rich, that reverberated and filled the valley. Then, we piled back into the cars and rode over the rocky terrain, tired and happy and lonely for home.